Gary and I both attended the same catering college Highbury College in Cosham, Portsmouth UK and trained as chefs and patisserie chefs. I was in the year above him and both him and I competed at Hotel Olympia in London. Once I knew I was exhibiting at the show I messaged Gary via Facebook to see if he would visit our stand as Gary was attending the show only on the Sunday and cooking and demonstrating. I approached Gary after his book signing in the morning and briefly chatted about my cooking and cake decorating school here in Daisy Hill Brisbane and invited him over to the stand. Although he was busy and about to start a lunchtime demo he said he would visit, later that day. Gary had another book signing at 3 pm and as of yet had not come over and I knew that I might loose this opportunity. I waited patiently as he signed and spoke to all of his book supporters and then afterwards he saw me and then we went back to my stand. I was very pleased to show him my book as I had written a entire page about Highbury College and the amazing lecturers that inspired me. We chatted about our inspiring chef lecturers and how we benefited from having inspiring people teach us. We spoke about one of our pastry chefs who had very flamboyant colours in his pastry dishes( I think he was actually colour blind as they were so strong in colour!) and had a chuckle together. I showed Gary my book and read to him the chapter about how my cake journey began by attending a college interview by an amazing inspiring lecturer Colin O'Dell, it was lovely to hear about Gary's amazing journey after college too. He too had traveled overseas to Europe to expand his cooking skills and knowledge of food. Many times I have missed out on opportunities in which I have not pushed myself, or allowed people to push me aside. And so I was pleased that I was insistent and went back to see Gary in the afternoon, as that connection may never have ever had happened. Life has many opportunities and attending this show was a great opportunity in sharing the sweetness. Miguel Maestre also visited our Cake and Cake Decorating stand at the Brisbane Good Food and Wine Show. Miguel is such a vibrant person and his energy is very warming. We spoke about a few of the State Cake shows and he asked why I was not involved in them? I replied I am still waiting for the invites! I told him that I do a lot within my local community and do free demos within 4 of my local library's, throughout each year. I just want to make a difference in my community. We chatted about the cake baking and cake decorating classes I run and was amazed at the cheeseburger cake and fries that I had on the stand. He loved his fondant figurine on the cake and we took extra pictures of him pretending to bite Matt Morans head off! Miguel has co-hosting role on TEN's Logie winning show "The Living Room", that has catapulted him into the world of TV working alongside Amanda Keller, Dr Chris Brown and Barry DuBois. Other TV credits include "Boys Weekend" (airing in more than 100 countries worldwide), "Miguel’s Tropical Kitchens" where he charms his way through the tropics of North Queensland, cooking with exotic ingredients in breathtaking locations, "Miguel Feasts" airing on Network 10 and internationally and "Weekend Feasts" airing on Network Ten. 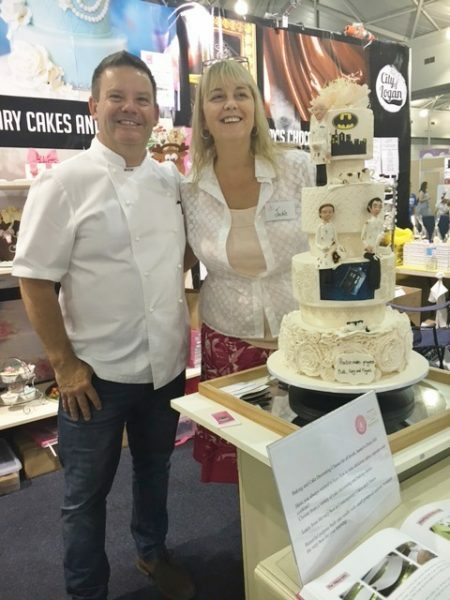 Matt Moran also visited our Cake and Cake Decorating stand at the Brisbane Good Food and Wine Show. He chatted briefly to my son Adam and we took a few pictures. His fondant figurine that I had made his blue eyes matched his! I told him I have been staring at his face over the last week, trying to get his figurines face right.